Synthetic peptide within Human GIV aa 1750-1850 (phospho Y1765). The exact sequence is proprietary. Our Abpromise guarantee covers the use of ab130424 in the following tested applications. Primary incubation for 10 minutes at room temperature. Plays a role as a key modulator of the AKT-mTOR signaling pathway controlling the tempo of the process of newborn neurons integration during adult neurogenesis, including correct neuron positioning, dendritic development and synapse formation. Enhances phosphoinositide 3-kinase (PI3K)-dependent phosphorylation and kinase activity of AKT1/PKB, but does not possess kinase activity itself. Phosphorylation of AKT1/PKB thereby induces the phosphorylation of downstream effectors GSK3 and FOXO1/FKHR, and regulates DNA replication and cell proliferation (By similarity). Essential for the integrity of the actin cytoskeleton and for cell migration. Required for formation of actin stress fibers and lamellipodia. May be involved in membrane sorting in the early endosome. Phosphorylation is induced by epidermal growth factor (EGF) in a phosphoinositide 3-kinase (PI3K)-dependent manner. Phosphorylation by AKT1/PKB is necessary for the delocalization from the cell membrane and for cell migration. Membrane. Cell membrane. Cytoplasm > cytosol. Cytoplasmic vesicle. Cell projection > lamellipodium. Localizes to the cell membrane through interaction with phosphoinositides. 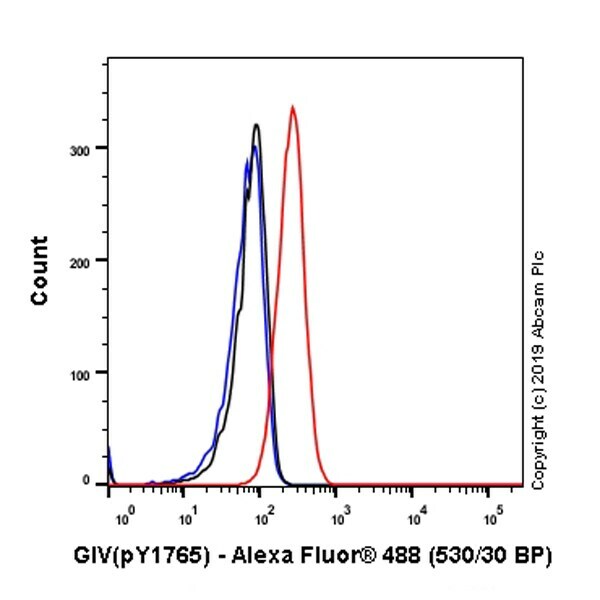 Flow Cytometry analysis of MDA-MB-231 (Human breast adenocarcinoma epithelial cell) cells labeling GIV with purified ab130424 at 1/20 dilution (5.5 µg/ml) (red). Cells were fixed with 4% paraformaldehyde and permeabilised with 90% methanol. 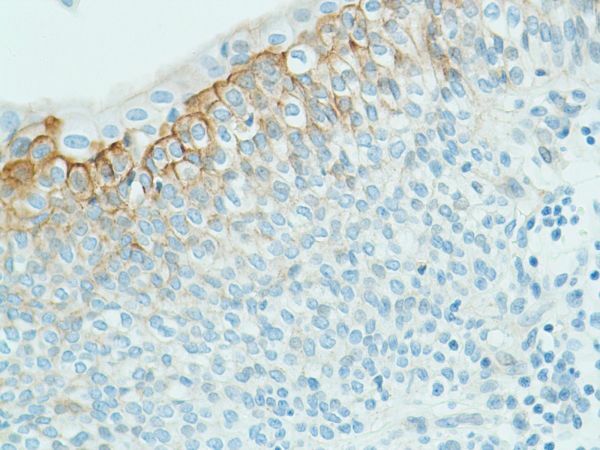 A Goat anti rabbit IgG (Alexa Fluor® 488, ab150077) secondary antibody was used at 1/2000 dilution. Isotype control - Rabbit monoclonal IgG (ab172730) / Black. Unlabeled control - Unlabelled cells / blue. 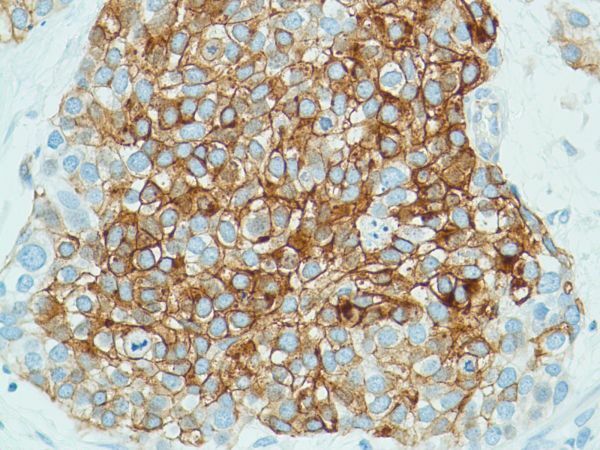 Formalin-fixed, paraffin-embedded human colon adenocarcinoma Stage 4 tissue stained for GIV (phospho Y1765) using ab130424 at 1/100 dilution in immunohistochemical analysis. Formalin-fixed, paraffin-embedded human colon adenocarcinoma Stage 3 tissue stained for GIV (phospho Y1765) using ab130424 at 1/100 dilution in immunohistochemical analysis. 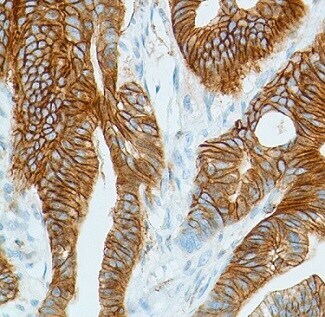 Formalin-fixed, paraffin-embedded human colon adenocarcinoma Stage 2 tissue stained for GIV (phospho Y1765) using ab130424 at 1/100 dilution in immunohistochemical analysis. 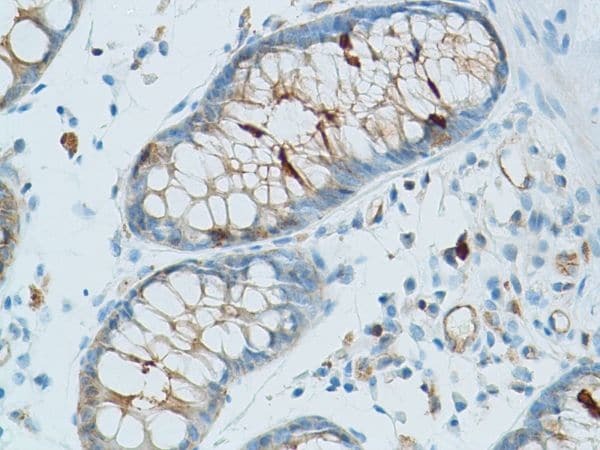 Formalin-fixed, paraffin-embedded human colon tissue stained for GIV (phospho Y1765) using ab130424 at 1/100 dilution in immunohistochemical analysis. Formalin-fixed, paraffin-embedded human bladder transitional carcinoma tissue stained for GIV (phospho Y1765) using ab130424 at 1/100 dilution in immunohistochemical analysis. Formalin-fixed, paraffin-embedded human bladder tissue stained for GIV (phospho Y1765) using ab130424 at 1/100 dilution in immunohistochemical analysis. 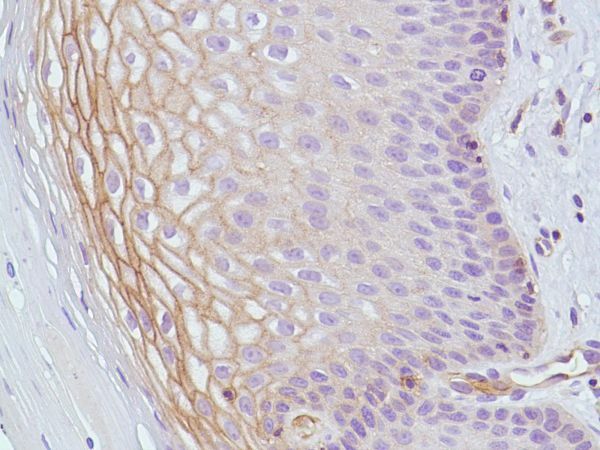 Formalin-fixed, paraffin-embedded human skin tissue stained for GIV (phospho Y1765) using ab130424 at 1/100 dilution in immunohistochemical analysis. 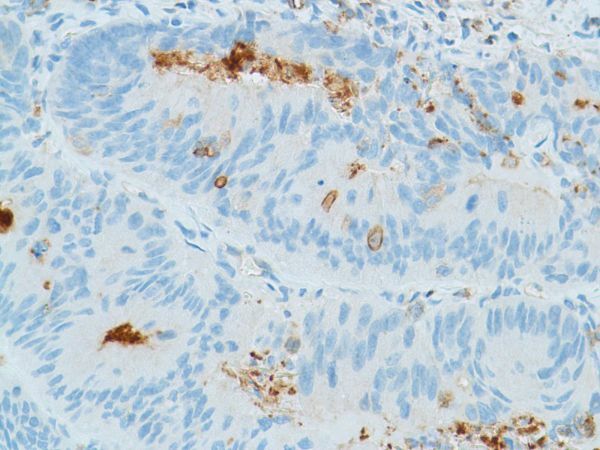 Formalin-fixed, paraffin-embedded human colon adenocarcinoma tissue stained for GIV (phospho Y1765) using ab130424 at 1/100 dilution in immunohistochemical analysis. Publishing research using ab130424? Please let us know so that we can cite the reference in this datasheet. There are currently no Customer reviews or Questions for ab130424.